Barbara A. Ramsay is the new chief conservator at The Ringling Museum. She has almost four decades of experience in art conservation with a focus on managing, directing, and carrying out complex conservation treatments on easel paintings, murals, historic painted finishes, and modern art objects. 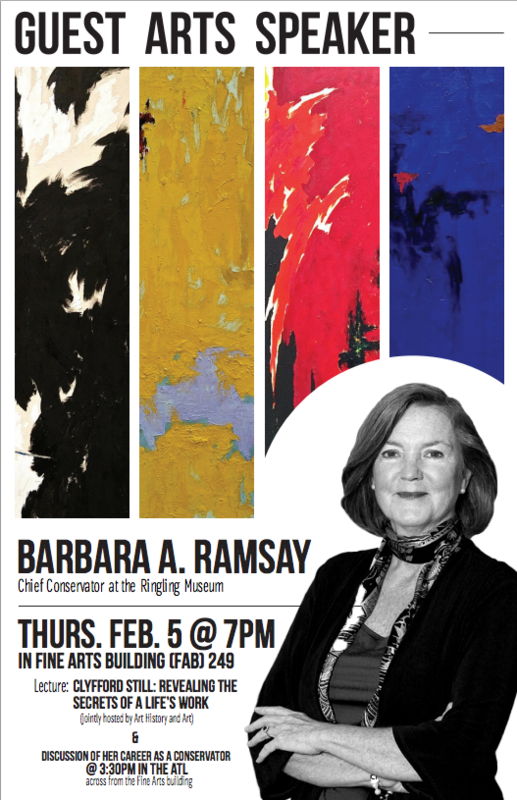 For many years, Dr. Ramsay coordinated the conservation of paintings for the estate of American abstract expressionist painter Clyfford Still. Her lecture will address her work with this collection and the manuscript for the small book that she is co-authoring with Susan Lake (Hirshhorn Museum & Sculpture Garden) and Alan Phenix (Getty Conservation Institute), entitled Clyfford Still: The Artist’s Materials. This book forms part of the series published by the Getty Conservation Institute. The books in the series thus far are on Willem de Kooning, Jean Paul Riopelle, and Lucio Fontana. 3:30 pm – Informal Discussion: A career as a conservator. 7:00 pm – Lecture: Clyfford Still: Revealing the Secrets of a Life’s Work, followed by a Q&A with Professor Emeritus Roald Nasgaard serving as respondent/mediator.